You Had one for Pre-K? A year book from pre-kindergarden…this is the answer I came up with for today’s Daily Post. At first I thought about a hair brush that I still have from when I was in 6th grade…but that’s a whole other story and was outdone by my old crusty yearbook. I remember sitting in pre-k putting the yearbook together. The night before I had my mom fussing about having to give pictures from the album in order to complete the school project. I was told to take care of the pictures and not let anything happen to them. Once I came home with the finished project my parents looked at it, then looked at each other, then looked at it again. “This is it?” They asked with a puzzled smile on their faces. “Oh….it’s nice….”. It was tacky. It didn’t make sense and it just wasn’t that appealing. Over the years, it got tossed around between moves and relocations. I lived in another part of the world for a while and mom held on to it for me along with some other junk I refused to throw away. Now, over 30 years later, I still have it with me, taking up space in my basement. 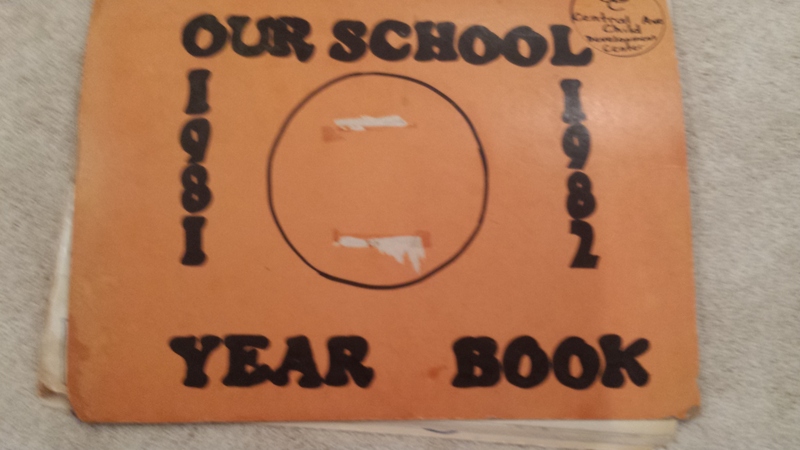 I’ve been clowned and ridiculed for still holding onto this “yearbook”. Pages are missing, torn and faded. But it meant so much me as I put it together and I’m still not ready to part with it. No one gets it but me. Oh well. Author new3creationPosted on June 12, 2014 Categories UncategorizedTags creativity, daily prompt, random7 Comments on You Had one for Pre-K?